The Knitting Pirate » In Which the Pirate Contemplates Spinning. « In Which the Pirate Stalls. In Which the Pirate Contemplates Spinning. I have half a pound, or eight ounces, of roving. It is dyed in five different colors. 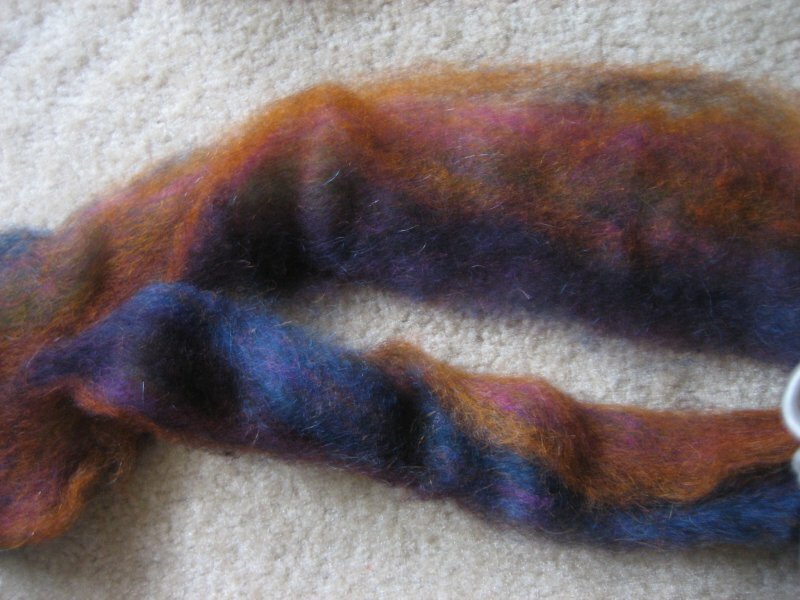 I've spun a few yards and plied them together, but because of the five different colors, it's kinda muddy-looking. I'm thinking that when I spin this up for real and not just for experimentation, I should split the roving by color first, and try to do some kind of graduated something or other. At least I could get the orange free. Ooh, maybe one ply of orange and one of the rest of the colors? I don't know if that would look well at all. Though it will take some time to separate, and I'm sure I'd get some of one color into another, I think in the long run I'll be glad for it. I think next time I do this, I'm going to buy separate colors, not roving that's dyed in stripes. Live and learn, live and learn. Also, there was some talk at Wednesday's SnB about a local spinning class/group/something that meets on Sundays. That could be useful! This entry was posted on Friday, June 22nd, 2007 at 10:50 and is filed under spinning. You can follow any responses to this entry through the RSS 2.0 feed. Both comments and pings are currently closed.